Stress is the ratio of applied force F to a cross section area - defined as "force per unit area". A normal force acts perpendicular to area and is developed whenever external loads tends to push or pull the two segments of a body. 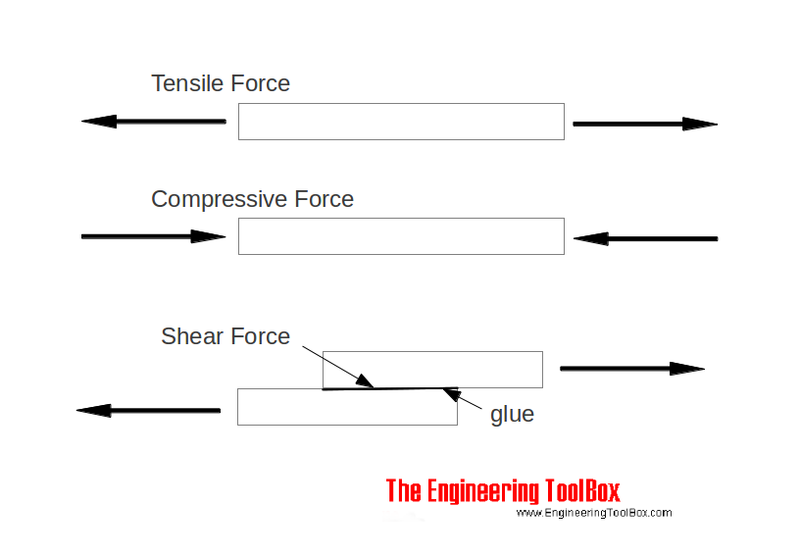 A shear force lies in the plane of an area and is developed when external loads tend to cause the two segments of a body to slide over one another. Strain is defined as "deformation of a solid due to stress". Note that strain is a dimensionless unit since it is the ratio of two lengths. But it also common practice to state it as the ratio of two length units - like m/m or in/in. Most metals deforms proportional to imposed load over a range of loads. Stress is proportional to load and strain is proportional to deformation as expressed with Hooke's Law. Modulus of Elasticity, or Young's Modulus, is commonly used for metals and metal alloys and expressed in terms 106 lbf/in2, N/m2 or Pa. Tensile modulus is often used for plastics and is expressed in terms 105 lbf/in2 or GPa. The Bulk Modulus Elasticity - or Volume Modulus - is a measure of the substance's resistance to uniform compression. Bulk Modulus of Elasticity is the ratio of stress to change in volume of a material subjected to axial loading. Engineering ToolBox, (2005). Stress, Strain and Young's Modulus. [online] Available at: https://www.engineeringtoolbox.com/stress-strain-d_950.html [Accessed Day Mo. Year].